These beautifully marbled deviled eggs are sure to be a talking point! The creamy filling of avocado, egg yolk and wasabi gives a kick of heat without being overpowering. 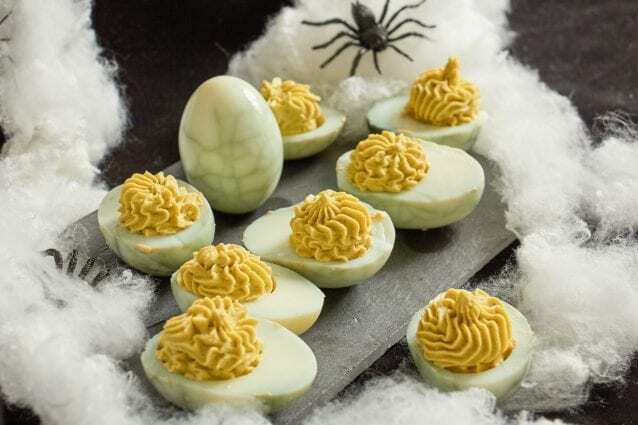 These eggs will make a great Halloween party dish and are easy to make ahead of time as they will sit in the fridge until you need to assemble them. Place in eggs and blueberries in a small pan. Cover with water, cover pot and bring to boil over high heat. Let eggs boil for 5 minutes, then turn off heat. Let eggs sit in the blueberry water for 10 more minutes. Remove eggs, one at a time, and gently press and crack the shell with the back of the spoon. Place cracked eggs in a bowl and add the blueberry water. Allow eggs to cool to room temperature, then place the eggs in the blueberry water in the refrigerator for 6 hours or up to overnight. Peel the eggs and cut in half lengthwise. Scoop out the yolks and place in a bowl. Add avocado, wasabi, lemon juice and salt to the egg yolks and mash together until smooth. 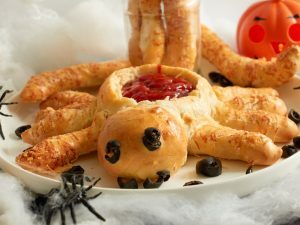 Place avocado mix into a piping bag and pipe into the hollowed egg halves. Prior to serving, garnish eggs with sesame seeds if using. You can also use food coloring instead of blueberries for the egg dye – you could even experiment with different colors! 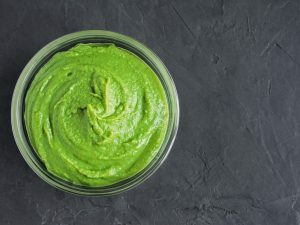 For easier piping, chill the avocado mixture in the refrigerator for an hour before using. If you prefer, simply spoon the mixture into the egg halves instead. If you want to make more eggs, such as 8 instead of four, simply double the amount of blueberries for the soaking water.